A free online browser game was recently launched. It’s called The Power of Research. It was designed to bring people closer to science and allow them to experience (virtually) what it’s like to be a biomedical scientist. The interface looks very simple, but the features are anything but… check out the trailer here. To play, you need to nominate a username, password and email account… or alternatively you can login using a Facebook account (which means you can play with your friends). 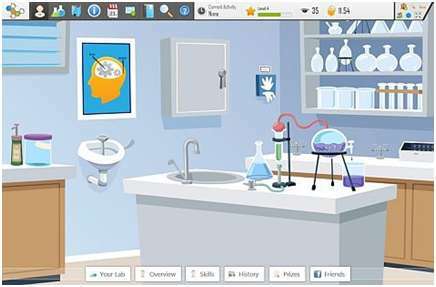 You then get to select your avatars features (gender, hair and t-shirt colour) — but like all labs health and safety has made sure you keep your goggles and clichÃ© white labcoat on! Then you select your country and institute of research*, followed by your research area and final thesis topic. There are 9 main research areas at present (brain, cardiovascular, cancer, infectious disease, immune system, gender health, paediatrics, skin or digestive system). I chose cancer with a thesis in ‘T cell infiltrate and outcome following resection of intermediate-grade primary neuroendocrine tumours and liver metastases’… hmmm, impressive!! Then you’re ready to start your first research project in the lab. As you play you get to give yourself skill points across the skill categories: DNA cloning, microscopy, isolation (of DNA I imagine, not towards becoming an introvert! ), negotiation, teaching, publication and pre-experiment skills. You will build on these as you become more successful. Aparently, success is defined by being ‘competitive, collaborative and communicative’ to reach aims such as winning awards and becoming the leader of a research institute. Whilst playing the game you’ll be kept busy with tasks such as applying for grant funding**, managing equipment and staff, reviewing the literature***, publishing results and attending conferences. There is also a simple biomed game you can play within the game whilst waiting for your results to come in. The people who put this together really thought of everything! What a great example of science communication, and suggest that anyone who wants to understand more about the life of a scientist should have a go at it (especially BSc students!!). * Since the game is relatively new (launched on the 23rd of February 2011) the options within the game are still somewhat limited, but I imagine they are working to improve this as user numbers increase. **Before all else of course. Oh, and I got rejected during the first round as they ran out of money for the week and told me to reapply on Monday! ***There’s an up-to-date (virtual) scientific library built in, with real images. How cool! I think I’ll point the BIOL102 students at this one, Jennifer! Actually the game evolved by itself from some Office 98 CD’s that were sitting around in an old drawer. The sun shining through the window caused the drawer to heat up and the CD’s melted together and formed the program. This was proved to be possible in the Miller-Urey experiment, you know. Any updates to the program are going to be entirely random program-code mutations, of the information-increasing kind seen everywhere (*citation needed). The researchers have got some more Office 2003 CD’s in another drawer, but they say that programs wouldn’t likely evolve twice Apparently the magnetic field in the CD drawer was just right to get the little mirrors on the CD’s to line up perfectly, and the high UV due to global Warming caused latticing on the CD surface at precisely the correct angle to make a valid .exe file for Windows computers. Neat eh?